A mere 16 pages. But makes some really insightful points that apply to numerous other issues that we face now.Good. This little booklet is a 3, but the concluding paragraphs are a 5. Dismissing the particular question of D&D: what maner, direction and goal of 'play' is appropriate for our children....and for ourselves. How would God have us use our 'down-time'? Pure self-indulgent pleasure, or as an aid to our dominion purpose, under God. "They want our children. They want our future. "Who wants our children? TSR? WoTC? Parker Brothers? Who wants our future? Gary Gygax? Weis and Hickman? That blurb on the back gives a sense of this book's paranoid tone. This book was written at the height of the role-playing scare (think Mazes and Monsters). The authors are honest enough to admit that D&D and other RPGs don't cause madness or suicide, although they take pains to point out that marginal and/or disturbed people can and do play D&D. It isn't mentioned that the marginal and disturbed can also watch television, eat chocolate, listen to Bach, and read the Bible. RPGs are viewed with suspicion from the first page because they don't "take place on a board." (Oh my gosh. Video games don't either. Neither does tag. Or Twister. Yikes! The influence of the boardless game abounds!) In a very condescending tone, the authors continue: "Instead, you play in your head. In D&D the basic rule is, 'Use your imagination. Stretch it to the limit.' Game boards and little men can be so confining" (p. 2) Having grown up in a fundamentalist Christian home, I suspect that it is this reliance on and cultivation of one's imagination and creativity that threaten the authors. Anything that smacked of fantasy scared and even angered my folks, who had no problems believing in the literal, historical existence of a talking serpent. I don't think this is accidental; it is almost as if using your imagination fantastically makes the transparently mythical nature of much of the Biblical narratives readily apparent. Fundamentalists feel this cognitive dissonance and so want to cut it off at the root, which is to say, the creative imagination. As well, the idea of "alignment," of being able to create and play chaotic and/or evil characters, disturbs the authors immensely. According to the authors this is because playing evil or chaotic characters molds one's mind and shapes one's inclinations so that the player slowly and subtly becomes evil and chaotic in real life. (Which is why Stephen King and Dean Koontz have basements filled with the buried corpses of their victims, and actors who play villains inevitably commit real crimes.) I think it is because the multi-axial alignment sytem in RPGs reveals that morality is complex and that there are different ways (not all good or skillful of course) of relating to situations. This is a direct challenge to the simplistic, dichotomous thinking that afflicts fundamentalism of every kind. The authors are also bugged by the "central role" of magic users and clerics in most game systems, and they see RPGs as methods for indoctrinating children into occult practices. Evidently they mistake the Player's Handbook and the Dungeon Master's Guide for the Collected Works of Aleister Crowley or somesuch. You can tell how many standard deviations the authors' views are from the mean when they include the Smurfs and the Care Bears (!) in their inventory of occult influences in pop culture. In their list of suggested reading, the authors include the classic work of fundamentalist, "culture war" idiocy, Turmoil in the Toybox; this book famously claimed that Yoda introduced children to dangerous cults like Hinduism, Buddhism, and Judaism (the dangerous cult to which Jesus Himself belonged, according to that questionable source, the Bible). I can't take the piss out of the authors completely. They actually had a few good points for Christian parents, like suggesting that they create a library of other options in terms of games, books, etc. They also listed quite a few good authors like C.S. Lewis and G.K. Chesterton. They also prefer "educating" kids about RPGs, rather than prohibiting them outright, which was a nice contrast to my experience. 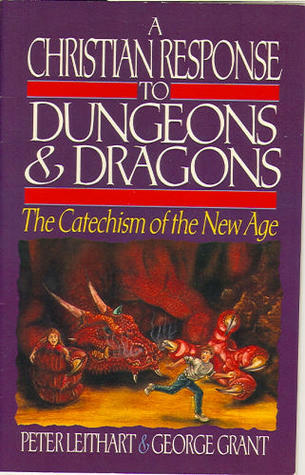 My parents unceremoniously threw my D&D materials in the trash after their pastor jumped on the "D&D = the occult = Satanism = Ozzy Osbourne = suicide" bandwagon of the late 70s/early 80s, and so I would have appreciated the authors' more nuanced (relatively speaking) approach.That the authors haven't actually experienced a real game of D&D is painfully obvious. (The very fact that they wrote an absurd polemic against a game usually played by nerds/geeks/dorks, and not aspiring necromancers, says a lot!) They reveal their abject cluelessness about the game when they say that the "characters with magical powers are the most powerful players in the game" (p.8). Spoken like someone who has never played a first-level wizard with 4 hit points and a handful of magic missile spells. This is not the worst piece of anti-D&D propaganda I have read, and I even concede that the author includes some sound parenting advice. The book is short and tries to answer the question, "Should a Christian play or allow their children to play Dungeons and Dragons?" The book actually does a fairly good job of describing Dungeons and Dragons to the laymen, except the author says that when creating a character one rolls for "age, diseases, parasitic infestations, and special skills". I'm not sure what edition he was playing, but I have never rolled for my character's parasitic infestations. However, you can be sure that in my next campaign every player will be rolling for diseases and parasites.As I was saying, the author's description of the game is pretty accurate. He even mentions how D&D has been used in schools to teach skills to kids. The author mentions how cartoons of the day reinforce fantasy rpg tropes. He calls She-Ra a "feminist version" of He-Man. I did not get the sense that he hated D&D from the book, at least not as much as other detractors of the day did.Eventually the author gets to the main issue, whether or not D&D a dangerous game. He mentions the violence and sexual content of game. He cites the Arduin Grimoire, which was a third-party supplement which probably had only a tertiary effect on D&D as a whole. When he starts to mention the occult influences he contradicts himself. The author states that D&D is the perfect vehicle for introducing young people to the occult. However, he then argues that the main danger of D&D is that players learn that demons and devils are not real and are just part of a game, while true Christians must view them as real. He then talks about how scripture forbids messing around with witchcraft, but he just said that witchcraft in the game isn't real (after saying how the game is full of real occult practices). Too confusing, dude.The book ends with a biblical view of leisure and play and some sensible parenting advice. Basically, parents should provide their children with positive leisure activities that they can do together as a family. He even suggests reading Tolkien to your children. There is no mention of throwing D&D books into the fire. There is a recommended reading list at the end, which includes some pamphlets published by TSR (the makings of D&D) and one of the best titled books ever, Introducing Children to the Occult. I can only imagine a book with chapters like "How to Help Your Child Pick the Right Coven" or "Baby's First Grimoire".This is an interesting relic of the Satanic Panic days of D&D. Today it comes off as a mild curiosity. Read it if you are interested in the history of the anti-D&D movement of the 80's. If you want some sensational entertainment, read Dark Dungeons by Jack Chick. Ridiculous. If you are thinking about getting this book to talk your kids out of playing Dungeons and Dragons, it won't work. If anything, trash like this will make them more eager to try to see what all of the fuss is about. ok book about the agument between Christianity and dnd! This was interesting, and addressed to the first edition of DnD, an extended review to follow. Thought-provoking, though I'm not sure I agreed with everything. Peter J. Leithart George Grant - Peter Leithart received an A.B. in English and History from Hillsdale College in 1981, and a Master of Arts in Religion and a Master of Theology from Westminster Theological Seminary in Philadelphia in 1986 and 1987. In 1998 he received his Ph.D. at the University of Cambridge in England. He has served in two pastorates: He was pastor of Reformed Heritage Presbyterian Church (now Trinity Presbyterian Church), Birmingham, Alabama from 1989 to 1995, and was founding pastor of Trinity Reformed Church, Moscow, Idaho, and served on the pastoral staff at Trinity from 2003-2013. From 1998 and 2013 he taught theology and literature at New St. Andrews College, Moscow, Idaho, where he continues to teach as an adjunct Senior Fellow. He now serves as President of Trinity House in Alabama, where is also resident Church Teacher at the local CREC church. He and his wife, Noel, have ten children and five grandchildren.